Last week I was working with some eighth grade teachers who were getting ready to launch a new reading unit, and to learn a bit more about their students, I asked them how well they thought their kids were able to interpret. They paused for a moment, not sure what to say, until one teacher said that they’d mainly focused on analyzing texts, not on interpreting them. Given the emphasis that the Common Core standards have placed on analysis, I wasn’t surprised to hear this. As I researched for Dynamic Teaching for Deeper Reading, the words interpret and interpretation only appear 15 times in the ELA Standards, while the words analyze and analysis show up over 150 times. What’s interesting, too, is that if you look at where those 15 words appear, you’ll find that while students are asked to interpret words, phrases, figurative language, figures of speech and visuals (such as charts and graphs), they’re not asked to interpret whole texts. They are, however expected to analyze other writers’, artists’, and filmmakers’ interpretations of texts and real-life events, which means the authors of the standards recognize that readers can interpret more than words and phrases. So why is there so little mention of interpretation in the standards and many classrooms? The skeptic in me has wondered if it’s because the powers that be don’t really want students to think for themselves. But I also suspect there’s a feeling out there that interpretation isn’t rigorous. That is, it’s seen as a loosey-goosey, touchy-feely way of reading, where readers are allowed to think whatever they want, based on their own experiences and feelings. This, however, is not at all what Louise Rosenblatt, the originator of the Reader-Response theory of reading, intended. She did believe that readers needed to bring their thoughts, emotions and experience with them in order to transact with a text. But she saw that transaction as part of “an active, self-ordering and self-correcting process, characterized by subtle adjustments and refinements of meaning in an effort to achieve a coherent interpretation,” which took into account all of a text, not just whatever parts might have spoken personally to a reader. That process can be seen in the journey a third-grade class I wrote about in Dynamic Teaching for Deeper Reading took. They were reading Cynthia Rylant’s picture book The Old Woman Who Named Things, which tells the story of an old woman who’s outlived all of her friends and is so afraid of losing anyone else that she shies away from forming attachments. Instead, she names inanimate objects that she thinks will outlive her, like her house and car, and considers them as friends. At first, this arrangement seems to work, but things get complicated when a puppy keeps appearing at the old woman’s gate. And those complications only gets worse when one day the puppy doesn’t come, and that ultimately forces the old woman to reconsider the decisions she’s made in her life. I launched the class on that process by inviting them to begin the book using a text-based Know/Wonder chart, which helped them develop a basic understanding of the who, what, when and where (though, you’ll see that not everyone knew what outlive meant.) And highlighted at the bottom, you’ll also see that questioning, they raised a question, which I knew could lead them right to the heart of the story. 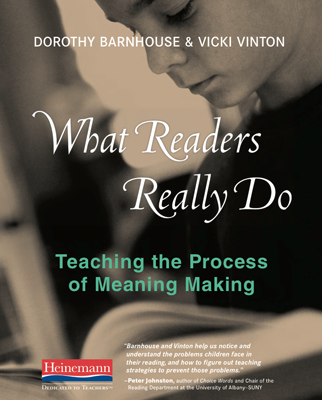 To continue that process, I reframed that question as a line of inquiry to explore and invited the class to draft what Dorothy Barnhouse and I first called “maybe statements” in What Readers Really Do. As you can see below, there’s quite a range in these maybe statements, with some students clearly drawing on more of the text than others were (though everyone cited a piece of evidence). At this point in the story, I paused to ask the students another question that would engage them in that “active, self-ordering and self-correcting process”: Why did the author make the dog stop coming to the gate? What might she want the old woman—or us—to see? I’ll have more to say about interpretation and how I see it connected to analysis in an upcoming post. But in the meantime, how do you think about interpretation—and how do you invite students to do it? This past year I’ve had several opportunities to present or run workshops on bringing more inquiry work into ELA classrooms, and one of the first thing I’ve found I need to do is ask people what comes to mind when they think of the word inquiry. Most envision some sort of project that involves investigating an issue, topic, phenomena or question. These kinds of inquiries almost inevitably involve some reading and writing, as students read to research topics and write to convey their findings. And sometimes the inquiry question or topic comes from a reading a text. For instance, a class might read Linda Sue Park’s A Long Walk to Water then decide to delve into an inquiry to learn more about what’s been happening in Sudan and why. In this vision of inquiry, reading and writing are tools for the inquiry, not the explicit focus, and whatever teaching accompanies that reading and writing is frequently delivered through explicit instruction of strategies and skills. What I’ve been talking about in my work, however, are inquiries into the actual texts that students are reading and writing. It’s the kind of inquiry that Katie Wood Ray writes about in her wonderful book Study Driven, where she shares what a class of first-graders discovered during an inquiry into punctuation and how one of those first graders incorporated that learning into her writing. But here are two example of the genre, one by a contemporary practitioner and the other by the 17th century Japanese master Basho. What do you notice about them? To explore and investigate this question, take a look at the following samples. Do you notice anything similar between them, such as how they’re structured or how they effect you? Do you see any patterns, again in structure, effect, features or word choice? On the other hand, if you’d like to compare your ideas with those of an award-winning poet and professor—or learn more about how the 5-7-5 rule came into effect and why it misses the real point of haiku—here’s a link to Michael Dylan Walsh’s “The Discipline of Haiku.” Also please consider sharing what you think you learned about haiku and how the experience felt—as well as any haikus you may have written—by leaving a comment here, on twitter (#tomakeaprairie) or the Dynamic Teaching for Deeper Reading group’s Facebook page. But now go eat a cookie before there’s only a lone red hot on the plate! Like many literacy educators, last year I found myself reading Visible Learning for Literacy, by Doug Fisher, Nancy Frey and John Hattie. The book breaks down the process of teaching and learning into three phases: teaching for surface learning, deeper learning and ultimately for transfer. And for each phase, it recommends specific teaching practices based on their effect size, i.e., “the impact a given a approach has” on accelerating student learning. Being someone who tends to want to get to the deep stuff right away, I was curious about what the authors had to say about surface learning, along with what practices pack the greatest punch. They believe that surface learning is the foundation on which deeper learning is built, and among the recommended practices for that phase, I saw direct instruction, which comes with an effect size of 0.59. That led me to watch one of the videos that can be found on Corwin’s resource page for the book. If you go to the link, you’ll see a teacher providing direct instruction on how to punctuate dialogue to her 9th grade class. Clearly, she adheres to the features of direct instruction as stated in the book, but I couldn’t help thinking that something was wrong here. These were 9th graders who, I’d be willing to bet, had been taught to punctuate dialogue ever since third or second grade. This seemed to be another case of students having been taught something they didn’t fully learn, which can happen for a number of reasons. They might not have had enough time to practice for the learning to take hold. They might not have found “correctness” important. Or, as I suggested last week, there might have been something in the top-down teaching practice that didn’t fully engage them because it didn’t positioning them to be protagonists in their own learning. But what would that look like when it comes to something like punctuating dialogue? It just so happens that I wrestled with that very question last year, as I worked with several schools whose upper grade teachers wanted to teach writing and punctuating dialogue in their narrative units. In each case, the teachers had noticed that their students didn’t know how to punctuate dialogue, despite it having been taught the year before. So here’s what we did: I asked the teachers to gather up the mentor texts they’d used to help their students develop a vision of narrative writing. And among them was Maribeth Boelt’s popular book Those Shoes, about a boy who longs for the expensive sneakers that all the popular kids were wearing. Immediately we noticed that Boelt constructed her dialogue, using a variety of sentence structures— as in, it wasn’t always “___________,” I or a character said. That variety, which we recognized as a craft move, helped give the book its voice, and we also recognized that it presented the potential for an inquiry into how writers write dialogue. To implement that, we decided to invite everyone to the rug to look at the following four samples from the book, which we projected on the SMART Board. I read each of the sentences out loud, then invited the kids to turn and talk, using the basic thinking routine I shared in another post, What do you notice and what do you make of what you noticed? In a sense, you could call this a rich task, as it offered multiple points of entry for students to engage in their thinking. Of course, some students at first only noticed what seemed the most obvious to them: that what was being said made the sentences different. In those cases, I acknowledged that was true, but then asked them to take another look at just the first two sentences to consider if there was anything else different between them. That led students to notice that the writer didn’t say who was talking in the first one (though they knew it was the narrator), while in the second the writer clearly told us. Noticing that, I then invited them to compare those two with the last two. The first thing most of the students noticed was that, like the second sentence, the writer said who was speaking, but many also noticed that where the writer named the speaker was different in each sentence. That made them think that in addition to writers not always telling you exactly who was talking, they could also decide to name the speaker before, in the middle or at the end of the dialogue. And noticing that, they also noticed that the writer shared additional information in the last two sentences. In the first, she gave us more information about who the speaker was (as in their job), while the last shared where the person was when they spoke. And we invited them to sort and categorize the sentences to see if there were even more ways that writers set up dialogue. With these new understandings added to the chart, we then invited the students to make some decisions about how they might revise the dialogue in their own drafts to reflect what they’d learn—and everyone was eager to do that. Many, for instance, wanted to add boldface to underscore a line of dialogue’s importance, while many others wanted to try placing the dialogue tag in the middle of the sentence because they thought that was cool. 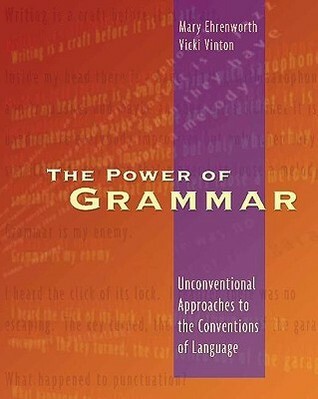 Feeling empowered by being the protagonists in their own learning, no one blinked an eye when we added a final direction: Once they made those revisions, they needed to go back and find a sentence that was similar to one in Those Shoes, and then punctuate theirs the same way Maribeth Boelt had done. And as the students got to work, the teachers decided to start the next day by revisiting all those sentences to co-construct another chart about how dialogue was punctuated. To be sure, this lesson took much longer than the one from Visible Learning for Literacy. But here’s the thing: If you go to the book’s appendix, you’ll find a list of practices arranged according to their effect size, from the most impactful to the least. And there you’ll see that Number 2 is Piaget’s approach. Hattie describes those as focusing “on the thinking processes rather than the outcomes and do not impose the adult thinking process on to children,” which is precisely what happened here. And Piagetian practices come with an effect size of 1.28, which means they have more than twice the impact on student learning as direct instruction does. And if you believe the words of Piaget I shared last week, you have to also think that these students will understand and retain far more by discovering how dialogue works on their own. I’ll surely have more to say about this approach in future posts. But if you want more bang for your instructional buck, consider letting your students be the protagonists of their own learning by letting them discover and explore. How Powerful Is Content Knowledge? 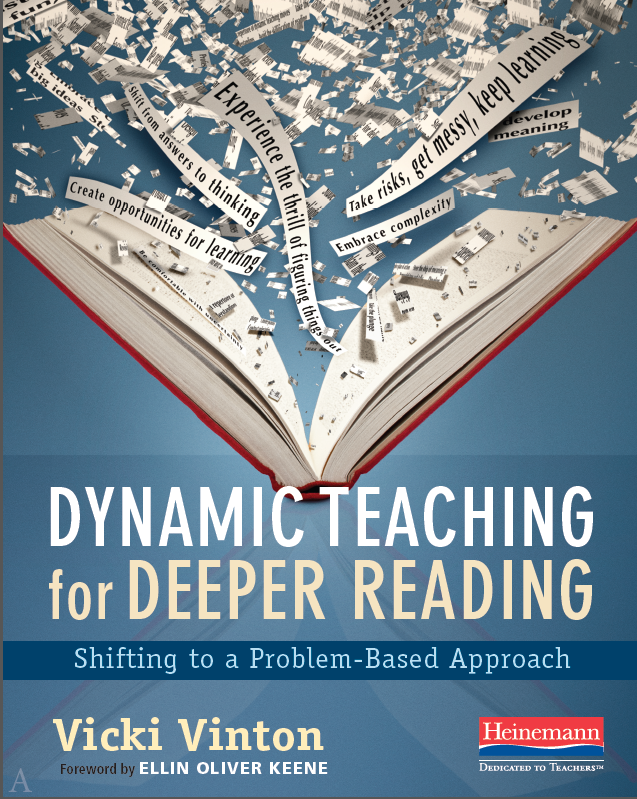 Here, Rebekah highlighted a passage from Dynamic Teaching for Deeper Reading that I imagined might provoke the kind of spirited discourse and cognitive dissonance that Ellin Keene wrote about in her foreword. That’s because, in addition to the still ongoing battles between phonics and whole language and Common Core-style close reading and balanced literacy, there’s another war still underway between knowledge-based and more inquiry and problem-based approaches to reading. The knowledge-based approach is rooted in a body of research that shows a connection between students’ prior knowledge and their reading comprehension. Based on that, knowledge advocates, like Doug Lemov, Daniel Willingham, E. D. Hirsch and the authors of the Common Core, argue that if prior knowledge helps students comprehend more, then teachers should focus on building up students’ store of knowledge. On the one hand, there is some logic to this, but it raises lots of questions. First and foremost is who gets to choose what knowledge should be taught to whom and when. The Core Knowledge Foundation, for instance, offers a knowledge-based Language Arts Curriculum for grades Pre-K though five that many students schools across the country use—and to my mind at least, many of their choices seem strange. Among other things, for example, first graders learn about Early World Civilizations, including Mesopotamia and Egypt, which, in New York State, is covered in 6th grade social studies. And during the unit they also learn about the world’s three monotheistic religions, Judaism, Christianity and Islam—along with a slew of vocabulary words I doubt a first grader will have much use for in their daily lives. Just this week, though, Education Week put out a special report called Schools and the Future of Work: What Will Our Students Need to Know? And in articles with titles like “The Future of Work Is Uncertain, Schools Should Worry Now,” “Stop Teaching Students What to Think. Teach Them How to Think,” and “Learning How to Learn Could Be a Student’s Most Valuable Skill,” the report definitely seems to the constructivist/inquiry/problem-based side of the debate. Consider, for a moment, the fifth graders I wrote about in my last post who had no idea of what a refugee was or a settlement camp before they read Katherine Applegate’s Home of the Brave. Rather than being taught those words and told about the crisis in Sudan, they figured those things out, and along the way learned many things, not only about the plight of refugees and the tragedy that occurred (and is still occurring) in Sudan. They learned how to see their own country through the eyes of someone quite different; how to discover our shared humanity with others whose lives are nothing like ours; how reading closely and attentively empowered them as readers and thinkers; and how verb tense and punctuation actually matter. And they also learned the deep satisfaction and pleasure that comes from “the curiosity to ask big questions [and] the drive to understand those questions deeply,” which one of the contributors to EdWeek’s report says are traits that are urgently needed in our every changing world. So why focus so much on content knowledge, when students can gain so much more? One of the most common text features found in professional books are subtitles, and having taken a look the last two weeks at dynamic teaching and deeper reading, I want here to explore and explain what’s behind this book’s subtitle: Shifting to a Problem-Based Approach. Many of you already know something about problem-based teaching and learning (a.k.a. PBL). In fact, PBL may already be in your teaching repertoire. But here’s a little background: Problem-based teaching and learning became established as a specific teaching practice when medical school professors in the 1960’s shifted from teaching their students through lectures and textbooks to setting them up to solve the kind of complex diagnostic problems they’d experience in the field. And in today’s world, PBL is joined by a plethora of what the Buck Institute for Education dubs “X-based learning” practices, such as project-based learning, game-based learning, design-based learning, brain-based learning—and even zombie-based learning! If Google and educational websites are any indication, it seems as if PBL has taken hold in many math, science and STEM classrooms, but it hasn’t gotten much traction in reading, where we tend to think that problem solving is only needed at the word level. But think back to (or catch up on) the students I wrote about last week, who worked their way through “Louisa’s Liberation.” They did, indeed, have to figure out what a word meant, but to do that they had to first figure out what point was being made about the fact that Louisa was playing doctor, not house or even nurse, as Katie and Emily thought. And figuring that out then allowed them to figure out what the author, Jean Little, might be trying to show them about people and life through the story. All this figuring out was needed because the writer conveyed this information indirectly. And in Dynamic Teaching for Deeper Reading, I propose that we see every instance in which a writer conveys something implicitly, versus explicitly, as a problem that text poses for readers. This can be something as deep and meaningful as what a writer wants us to consider about the human condition to something as seemingly simple as what or who a pronoun refers to. And part of the trick of a problem-based approach is becoming more aware of where, precisely, those problems are in a text. If you’re like the teachers who shared this text with me, your jaw might have dropped at what seems like the unnecessary confusion of this passage. Mostly it’s because the characters are referred to in different ways, which the writer doesn’t explicitly clarify. And just imagine how much your confusion would be compounded if you were a fifth grader who also didn’t know what the words dispute, Zen, monastery and monk meant. If we see these, though, as problems to solve and give students a chance to collaboratively wrestle with them, many are able to do what a small group of sixth grade students did. They had no idea what a Zen master was, or a monastery, but they reasoned that the Zen master must be some sort of teacher because he had a student, and that, whatever a monastery was, it was where the Zen master lived. They also recognized that a conversation was going on, and using what they knew about dialogue, they were able to figure out that the Zen master and the old monk were one and the same, as was the wandering and the visiting monk. And while there were questions about whether there was one or two one-eyed characters (one a student and the other a monk), one of the group made a case for them being one and the same, too, because he thought that if the one-eyed monk was a new character, he’d have been introduced with an a not the. A few weeks ago I invited teachers to construct an understanding of the deeper purposes of realistic fiction and then shared their ideas in a follow-up post. And last week I shared a lesson that helped fourth graders construct a deeper understanding of how scenes and details work. In both cases I, in the role of teacher, created opportunities for learners to invent new knowledge, and pedagogically that’s quite different than the kind of direct instruction with modeling associated with writing workshop mini-lessons. As a teaching practice, creating learning opportunities goes by many names. In his great book Mentor Author, Mentor Texts, Ralph Fletcher borrows a term from the world of computer programming and calls it an “open source” approach to teaching craft. Instead of teaching a specific craft move through a mentor text—which, as Ralph notes, “runs the risk of reducing a complex and layered text to one craft element”—an open source approach invites students to “look at these texts and enter them on their own terms,” which “gives students more control, more ownership.” While Katie Wood Ray describes this practice in her wonderful book Study Driven as an “inquiry approach” to teaching and learning, where students are similarly invited to notice and discover what writers do then try on the moves they’d like to emulate. While there are times I do teach through direct instruction and modeling, I increasingly use constructivist practices with both students and teachers. For students, for instance, who need additional time to wrestle with the concept of scenes versus summaries, I like to share the following two pieces by Lois Lowry about the same event and invite them to consider how they’re different in order to construct a deeper understanding of the purpose and craft of scenes. I was nine years old. It was a man’s woolen hunting shirt. I had seen it in a store window, it’s rainbow colors so appealing that I went again and again to stand looking through the large window pane. The war had recently ended, and my father, home on leave before he had to return to occupied Japan, probably saw the purchase as a way of endearing himself to a daughter who was a virtual stranger to him. If so, it worked. I remember still the overwhelming surge of love I felt for my father when he took me by the hand, entered Kronenburg’s Men’s Story, and watched smiling while I tried the shirt on. As you can see from the chart, students engaged solely in discovery learning—who constructed their own understandings of content through grappling and practice—demonstrated consistent growth in learning over time. The combination of students receiving both direct instruction and discovery learning ultimately reached the same level of learning, despite a somewhat precipitous drop along the way. But those who only received direct instruction were able to transfer less. For the record, this study involved fourth graders presented with a science problem, not a literacy one. But as I wrote in an earlier post, I think the process of constructing an understanding by developing hypotheses about what you notice that you then test out, refine and revise into theories, can be the same across the disciplines. It’s also worth noting that, whether we call this an open source, inquiry, constructivist or problem-based approach, there’s still lots of teaching to do. As you can see with my Ruby the Copycat example, I nudged students to deeper thinking by raising probing questions and inviting them to be more specific and precise about what they’d noticed. And from that, I named what they’d noticed in more generalized language so students could apply and transfer it to their own work. And you can see the masterful Kate Roberts do the exact same thing in a video of her working with middle school students studying a mentor argument text. You could say that both Kate and I set students up to notice things we might ordinarily teach through direct instruction, which, as Katie Wood Ray says in Study Driven, allowed them to uncover content versus receive it, which can deepen understanding. And finally there’s another reason to add this powerful practice to your teaching repertoire. According to Jerome Bruner, “Being able to ‘go beyond the information’ given to ‘figure things out’ is one of the few untarnishable joys of life.” So if you want to bring more joy to your classroom, consider creating opportunities for students to construct their own understanding, versus always teaching them directly.